Use the small gear icon in the right corner of the "Property Details" card to update financials, switch photos, and perform other key tasks. Stessa is designed with a minimalist approach to the presentation of information. This ensures that only the most relevant and important data finds its way to your Property and Portfolio dashboards. But don't let appearances fool you. Underneath the clean design lurks a powerful and comprehensive web of interconnected data that's easy to update once you know how to do it. If you need to update basic property info like type, square footage, year built, etc., just click the small gear icon to the right of the words, "Property Details" on your Property dashboard. Then select, "Edit Property Details." To change acquisition details like purchase price and date, click the same small gear icon to the right of the words, "Property Details." Then select, "Edit Financials." We suggest leaving the fields, "Capital Expenses & Rehab Costs" and "Past Earnings & Cash Out" blank for now. These fields will be phased out of future versions of Stessa in favor of more detailed tracking of both CapEx and historical cash flow data tied to specific dates. If you're not enthralled with the building photos Stessa auto-populated for a particular property, you can edit the order, delete, and add your own. To do this, click the same small gear icon to the right of the words, "Property Details" on your Property dashboard. 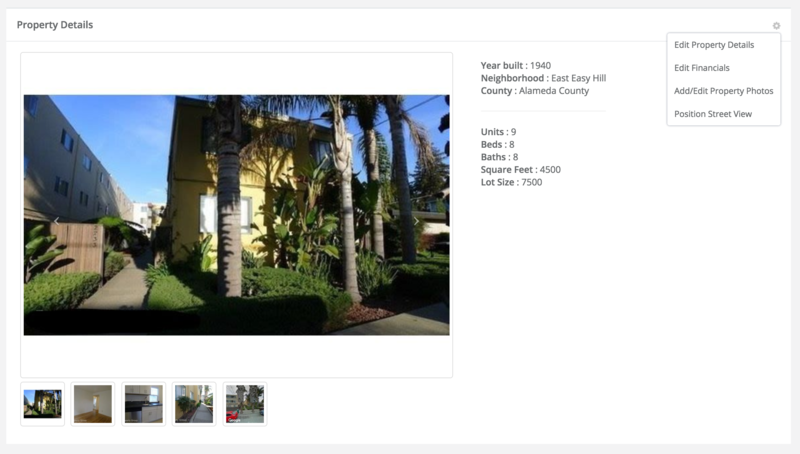 Then select, "Add/Edit Property Photos." Stessa stores the actual address of each Property you add to your account in the background so that the system can regularly update valuations, tax records, and other key details. That said, it's easy to change how a given Property presents itself in your Stessa account. To edit the display address or give a Property a nickname instead of an address, navigate to Settings > Portfolios. Simply click on the address or name of the Property you want to edit, and type the new address or nickname. You can edit Portfolio names the same way. Note that this will not change the original unique address that Stessa uses to match this Property to public records. If Stessa is pulling the wrong info for a particular Property because of a mismatched address, it's usually best to remove it entirely and add the correct property from scratch. Still having trouble editing or updating something?